WASHINGTON – After swearing an oath to protect the life of Barack Obama and then resigning, one former Secret Service agent is calling the president out for an alarming overreach of power he claims is risking the lives of Americans. “The president has abdicated his duty to preserve, protect and defend the Constitution, especially where illegal immigration is concerned,” Dan Bongino told WND in an interview. “We’re not escorting these people out, we’re escorting them into the country,” he said. Bongino, who during his time with the Secret Service guarded Obama, is the author of the New York Times bestselling “Life Inside the Bubble: Why a Top-Ranked Secret Service Agent Walked Away from It All.” The book offers an intimate look at life inside the presidential “bubble,” a haze of staffers, consultants, cronies, acolytes, bureaucrats and lobbyists that creates the “alternate reality” in which monumental policy decisions are made. And it is the story of a dedicated Secret Service professional who, after years inside the bubble, walked away in favor of sounding a clarion call to the American people in defense of sane government and the U.S. Constitution. 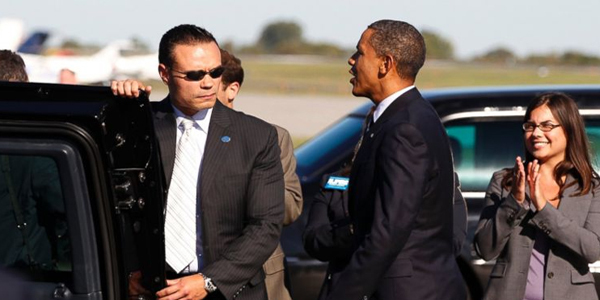 “I walked away because I swore to take a bullet for the president and left it all behind to take a bullet for the American people,” Bongino said. Bongino said it would have been unthinkable for him and his fellow agents to fail to secure event sites the president would be visiting in the same way that the president has failed to secure the borders. Bongino worries that the U.S. has become a post-constitutional society with a president who fails to honor the separation of powers. House Speaker John Boehner is raising the same issue with a lawsuit contemplated against the president. Bongino noted that even while running Secret Service investigations, getting access to personal tax information would take “an act of God.” Meanwhile, Lerner and others at the IRS were able to access this information and allegedly used it to intimidate opponents of the administration. But Bongino doesn’t believe impeachment is the answer, even if it’s warranted. “The political argument’s not there. Impeachment is an indictment, but you haven’t won the trial yet. To indict someone via impeachment knowing you’re going to lose a trial in the Senate is a fool’s errand,” he said. Instead, Bongino is calling on moderate Democrats to join with Republicans to put pressure on Obama and demand him to recognize the law of the land.